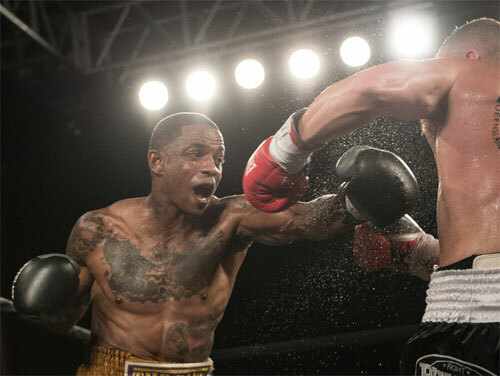 Hard Hitting Promotions capped off Philly’s busy, two-night, weekend boxing schedule with an eight-bout card at the 2300 Arena. After a delay of more than one hour, while the full house waited for the EMS crew to arrive, the show finally got started about 8:20 PM. 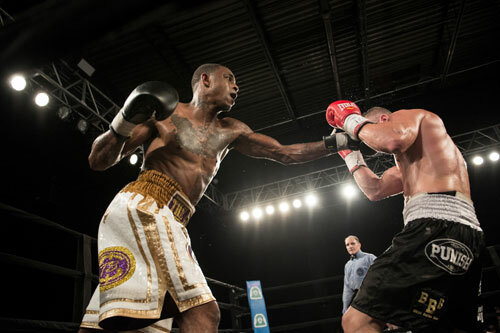 In the main event, Glassboro, NJ super middleweight Derrick Webster, 27-1, 14 KOs, trotted out his usual somnambulistic style for the overheated packed house, and for seven rounds, produced not a single moment that made the crowd thankful to have come to see him fight. Activity in the bout was low and excitement was nil. As usual, Webster possessed all the advantages in the bout, but was stingy in exercising them. Rather, he hovered in his southpaw stance and waited, instead of making something – anything – happen. His opponent, Australian Les Sherrington, looked capable but he was over matched and not so willing to take many chances. So for seven rounds, the pair circled each other, occasionally tossing a punch or two. In each round, Webster consistently did a little more (which isn’t saying much), and won all the rounds. Finally in round eight, Webster cracked Sherrington with a right that hurt him badly. Webster followed up and landed a few more shots including another hook that put Sherrington on the canvas. The Australian got up, but Webster, suddenly motivated, dropped him again with a series of punches. 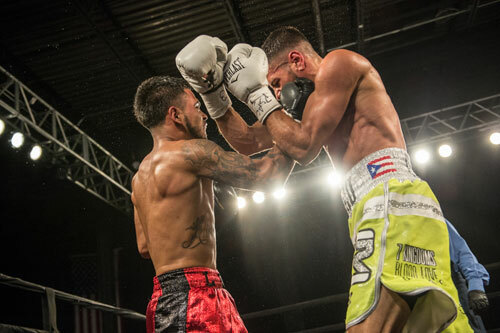 Referee Gary Rosato halted the fight and Webster added another victory – and splintered regional title belt – to his resume. The time of the TKO was 1:32 of round eight. Local lightweight Branden Pizarro, Philadelphia, 11-1, 5 KOs, dropped Hector Marengo of Puerto Rico, 7-13-4, 4 KOs, once in round one and again in round two, en route to a second round TKO. Pizarro entered the ring with his familiar sunglasses, mile-long entourage, and party-like atmosphere. When the bout began, he took immediate control, scoring sharp jabs and solid power punches right away. Pizarro landed a good left that toppled Marengo. He got up and made it to the end of the first round, but it was clear that his time was just about up. Pizarro went back to work in the second, and dropped Marengo with a right hand. When he hit the canvas this second time, referee Steve Smoger stopped the bout. The time was 1:32. 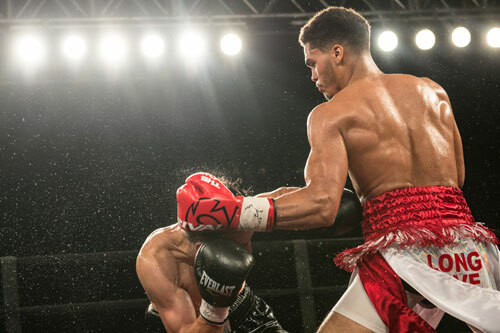 In a quick lightweight fight, Philly’s Samuel Teah, 14-2-1, 7 KOs, smashed Zack Ramsey of Springfield, MA, 8-4, 4 KOs, with a right uppercut in round one. The punch landed along the ropes sent Ramsey down, and from a kneeling position, he took the full ten-count from referee Gary Rosato. The time was 2:49 of the opening round. In a wildly entertaining lightweight brawl, Philly southpaw Jeremy Cuevas, 10-0, 8 KOs, stopped DC’s Deo Kizito, 3-4, 2 KOs, at 2:02 of the sixth and final round. Cuevas dominated the action, but there were numerous extended two-way exchanges between the pair. The best round was the third, when the two battled back and forth, landing freely and driving each other across the ring. Battle was exchanged along the ropes and in every corner. At one point, Cuevas staggered Kizito with his wilting punches, and referee Steve Smoger almost stopped it. He reached in and even put his hand on Cuevas’ chest, ready to pull him off. However, as we all know, Smoger loves to let fighters fight, and just couldn’t bring himself to end it. 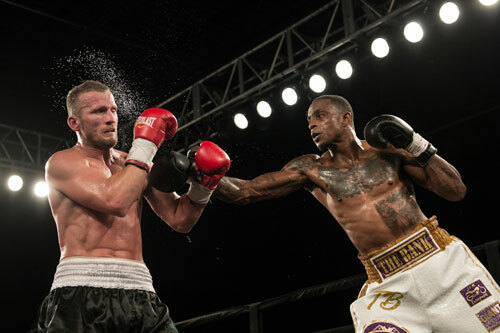 Cuevas complained to Smoger, eager for the TKO, but the action continued. Cuevas took the fourth and fifth, extending his clean sweep of the rounds. Then in the final round, just when it seemed the fight might go the full limit, Kizito went low twice on Cuevas. Smoger warned him the second time, but the infraction gave Cuevas the push he needed to finish the show. A hot-headed Cuevas responded with an all-out attack that culminated with a vicious combination that finally toppled his though opponent. As Kizito sagged down against the ropes, referee Steve Smoger stopped it without a count. 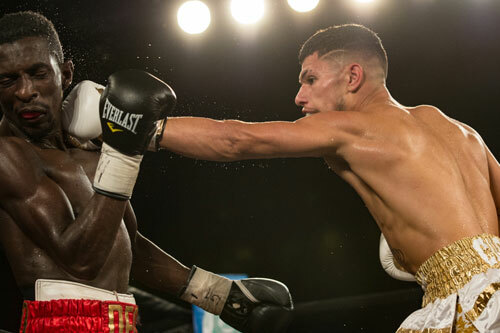 In a junior lightweight bout scheduled for six rounds between two Floridians, Gadwin Rosa 7-0, 6 KOs, stopped Angel Albelo, 4-10-3, 2 KOs, in round five. After winning the first four, Rosa dropped Albelo with a right. Angel beat the count, but as referee Rosato finished his mandatory count, Albelo walked away. Rosato followed him but when Albelo shook his head “no”, Rosato waved the fight off. The time was 2:05 of the fifth. Junior featherweights Jose Lopez, 0-0-1, New York, and Philly’s Rommel Cruz, 2-0-1, 1 KO, fought to a majority draw in their four rounder. 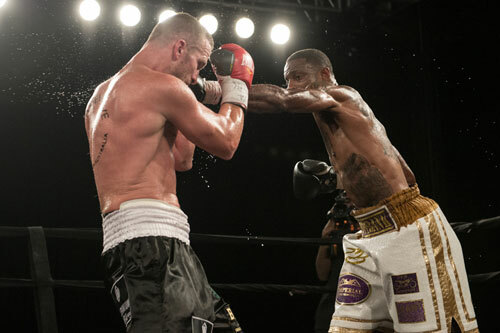 It was a heated match with both boxers having their moments in the bout. Cruz took the close first round on my card, but the debuting Lopez rebounded in the second and seemed to have the better of the final three rounds. The third featured the best action, with both fighters slamming home hard rights. A right uppercut by Lopez staggered Cruz, and was probably the best punch in the entire fight. The final round was telling in the ultimate scoring of the fight. Lopez appeared to have control and was well on his way to winning the final session. However, as the round was winding down, Cruz hurt Lopez to suddenly turn the tide. Lopez held on for dear life, and when Cruz tried to rip himself free from the clinch, the two tumbled to the canvas. Referee Smoger got them up and the action resumed briefly before the final bell ended it. Scoring the last round was tricky. Lopez won most of it, but Cruz nearly floored him before the end. I gave the round to Cruz, making the fight a draw on my card. Two of the three officials (Ron McNair and Lindsey Page) agreed and scored it 38-38. The third judge, Marc Werlinsky, favored Cruz 39-37. So, a draw it was. 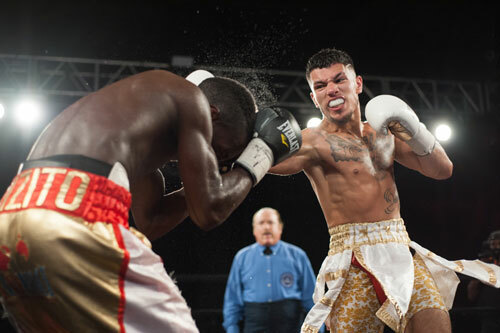 In a four round junior lightweight fight between two boxers from Puerto Rico, Christian Tapia, 5-0, 4 KOs, topped Israel Suarez, 4-6-2, 2 KOs, over the four round distance. Tapia hurt Suarez in round three, but was unable to finish him. Tapia swept all four rounds on my card, and coasted to a unanimous decision win by scores of 40-36 (Steve Weisfeld) and 39-37 twice (Lindsey Page and Ron McNair). 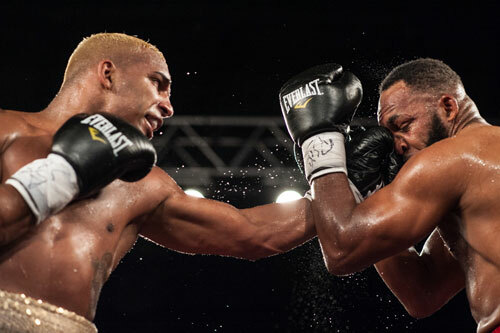 In the opening bout, cruiserweight Kenny Cruz of Bayamon, PR, 3-2-1, 2 KOs, defeated ancient former contender Prince Badi Ajamu, 29-5-1, 15 KOs, by six round unanimous decision. Badi, 46 and well past his prime, offered very little offense in the bout, and Cruz ran the tables through all six rounds. Although, I found it difficult to give Ajamu a round, the official judges saw it a little closer. Marc Werlinsky scored it 58-56, while McNair and Weisfeld had it 59-56. The show drew a full house of about 1,000 fans, despite the loss of two key bouts scheduled, but scratched the day before. Eric Hunter’s opponent allegedly pulled out due to injury, while debuting Benny Sinakin was unable to fight due to a medical snag. Sinakin says that his debut will now occur in October.